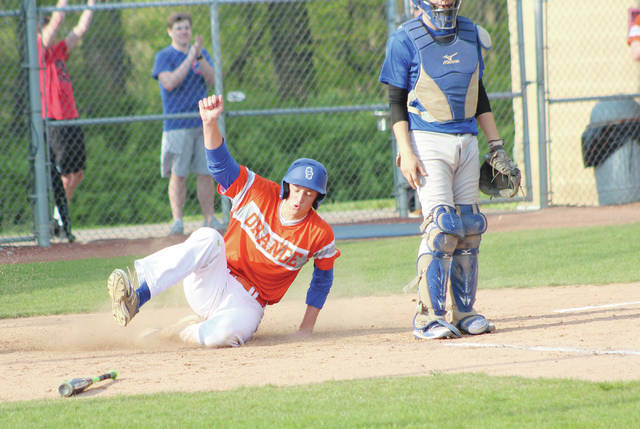 Orange’s Ben Miller slides safely into home during Wednesday’s Division I district tournament game against visiting Central Crossing. Olentangy Orange baseball coach Phil Callaghan sat legs crossed in the dugout after his Pioneers knocked off Central Crossing 9-0 in the second round of the district tournament Wednesday in Lewis Center. The 29-year coaching veteran usually spends his postgame interviews talking about 90s. He strayed from his normal routine this time. He even asked assistant Matt Lattig to drag the field – a pastime he reserves for himself. Callaghan tells it like it is. He hands out compliments – he just waits until they’re deserved. So, when pitcher Zach Beatty, who tossed six shutout innings for the win, was brought up Callaghan had one at the ready. Beatty has been working his way back from Tommy John surgery in July 2016. The Pioneers have won eight of their last 10 games and Beatty has started feeling like his old self along the way. He allowed just three hits and a pair of walks and managed to help himself out by snaring three come-backers, including one that might have saved a run in the sixth inning when the 35th-seeded Comets had first and third and two outs. It was the closest they came to scoring. Beatty was also pitch-efficient, tossing just 60 pitches and 48 for strikes. It was one of two times Central Crossing got a runner into scoring position. Austin Woods and J.J. Carr each singled to open the fourth – breaking up Beatty’s no-hitter. But, Ben Miller made a diving catch on a low line drive to center to prevent a run before a strikeout and a groundout ended the threat. Callaghan had compliments for Beatty’s battery-mate, too. Evans led the 23rd-seeded Pioneers (16-11) with two hits, a RBI and a run. His first hit led off the third. He stole second and scored on Jack Betz’s RBI single to give the Pioneers a 1-0 lead. Evans provided the big blow in a four-run fourth with a two-run single. Robbie Dayhuff added a two-run single in a four-run sixth to round out the scoring. Carr took the loss for the Comets (10-13), allowing five runs (two earned) on four hits and four walks with a pair of strikeouts. Orange meets top-seeded Olentangy Liberty in the district semifinals Tuesday at 5 p.m. at a site to be determined. The Pioneers are 0-3 against the Patriots this season, but that doesn’t deter Callaghan. “This is a year where I think anything can happen,” he said. Afterward, Callaghan couldn’t resist … he dragged the field.